This blanket has been with me since high school and traveled from Missouri to Washington state with me in 1995. I actually pilfered it from my best friend’s house after using it one night during a sleepover. I always felt like her family had nicer and more traditional things than my family – like name-brand clothes and extra blankets. 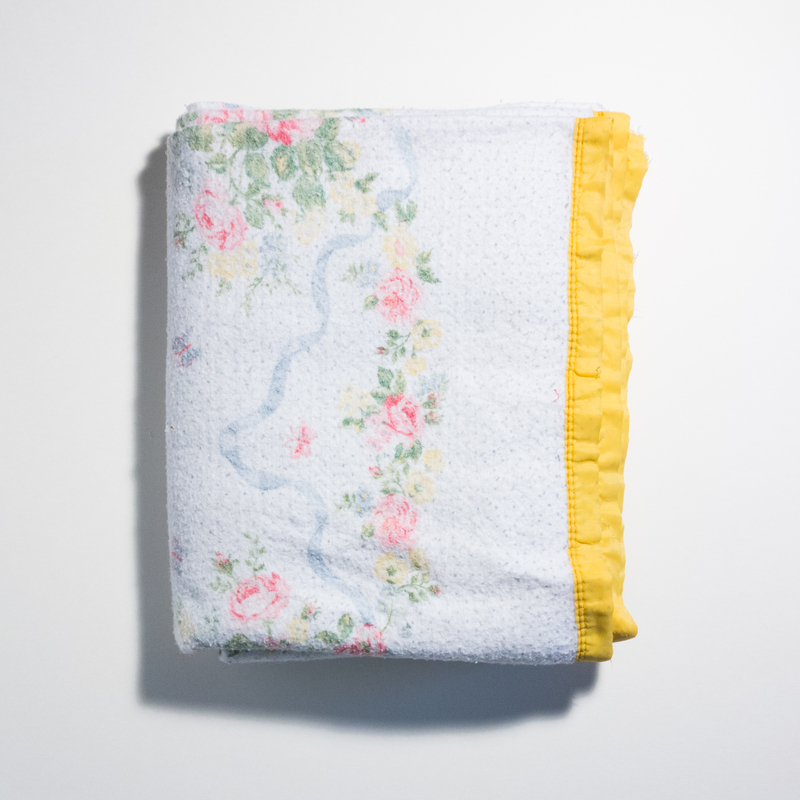 I marveled at its yellow, satin binding and floral print and believed it represented a high-functioning family. I wondered if having it at my house could make living with my family little easier. After a moment, I decided they wouldn’t miss it if it disappeared since they had so many in their closet already. So I packed it up with my overnight stuff and took it home with me. I did use it quite a lot at first, especially after graduation and into my 20s. But eventually I started using it less and began thinking it was quite ugly. Its power was all used up, but it still stayed folded nicely in my closet – used only occasionally as a last resort. To this day I am always taking inventory of the blankets (number, quality, and variety) in my linen closet making sure there are enough of them – a symbol of my own household success and hospitality. The best friend and I have since become estranged but this blanket has persisted in that collection until today. I am thrilled to have it immortalized in a sculpture.